Tucked away between two canals: the Great Union Canal and Regent’s Canal – if you squint on a sunny day, it’s not hard to see where it gets its name from. 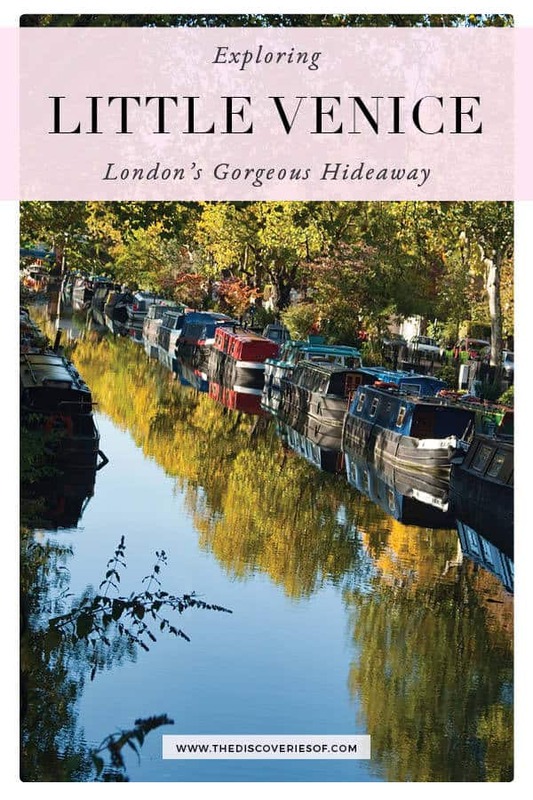 Planning a visit to Little Venice? Here’s what you should know before you go. First Up, Where is Little Venice? 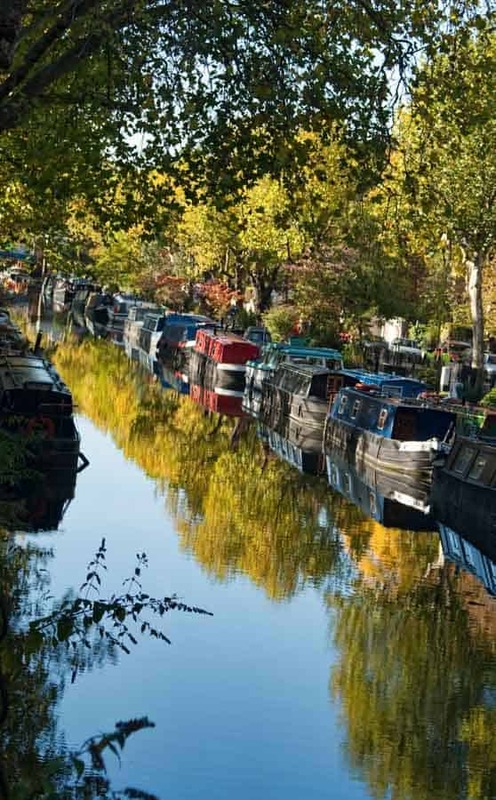 Little Venice is a charming and quirky area located in the popular residential area of Maida Vale in North London. Taking a boat trip in Little Venice is practically a rite of passage and deserves a spot on your list of top things to do in London. In an area best-known for its beautiful waterways, it’s no surprise that exploring it by boat is an absolute must. While they might not be the same as Venetians gondolas, London boats still have plenty of character to make your Little Venice London boat trip a memorable one. You’ll find many that are decked out in a traditional style, with all kinds of quirky colours and decor. There are various types of trips, but most involve floating down the canal on a barge, listening to the history of the area. Little Venice boat trips are really the perfect way to get to know the area, and they are just so relaxing. What could be more London than catching a live performance aboard a barge on the city’s canals? And by live performance, I mean a puppet show, to be exact. 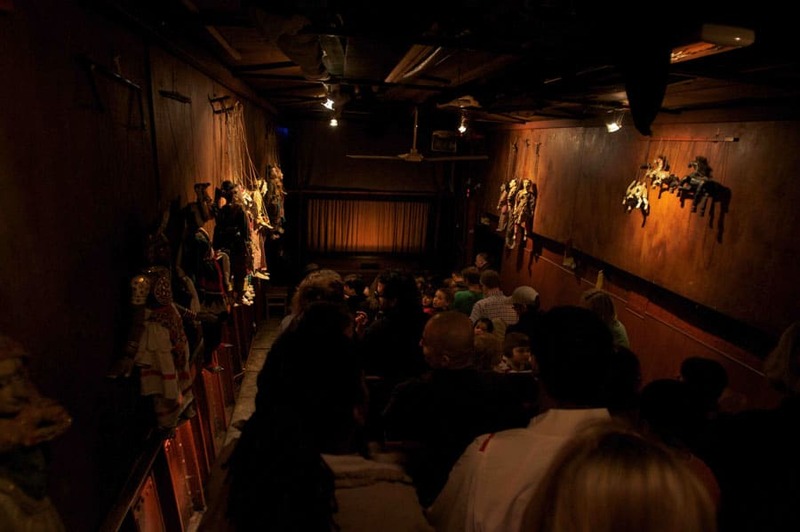 The Puppet Theatre Barge is a London institution and totally loveable. For more than 30 years, it’s been delighting the young and the young-at-heart with its puppet shows. It’s not the standard setting for a theatre show – but that only adds to the charm. Many of the shows on the calendar are classics that have been performed for decades, such as the classic The Town Mouse and the City Mouse! Fifty people can fit inside the barge, so it’s surprisingly spacious. Once the light dims, it’s easy to forget that you’re on a barge as the show gets underway. Definitely a unique experience. Another great theatre in Little Venice is the Canal Cafe Theatre, which specialises in comedy performances. It’s right on the edge of Regent’s Canal, with a pub downstairs. It’s an inviting and friendly space, but the real jewel is the theatre space upstairs. There, you’ll find (allegedly) the world’s longest-running live comedy show, NewsRevue, along with many other performances. Although its capacity is modest – just 60 seats – and its setting humble, it packs quite the punch. Big names including The Mighty Boosh have dropped in for a performance or two. It’s a “members only” theatre but it’s easy to sign up – you just pay £1.50 for your membership card, which is valid for a year. Water and gardens go hand-in-hand, offering a relaxing spot to take a break from the hustle and bustle of the city. That’s why I love Rembrandt Gardens which run along the Grand Union Canal. Opened in the 1950s, the gardens are well-manicured with a big grassy area that’s perfect for a picnic. When they first opened, the gardens were known as the Warwick gardens, but the name changed in 1975. This was in response to the city of Amsterdam donating thousands of tulips to celebrate their 700th birthday. In honour of the beautiful gift from across the seas, the park was renamed in honour of one of the Netherlands’ most famous artists, Rembrandt. It wouldn’t be Little Venice without a gondola or two! There’s no need to head to Italy when you can have a romantic boat ride right here in London town. Now, fair warning – finding information about the gondola tours can be a challenge. In fact, there are a few sites that say they don’t exist at all. I can assure you, however, they are there. It’s just all very un-2019 – you’ll need to find them once you’re at Little Venice, and ask for a ride. How will you know when you’ve found them? Well, they’re pretty unmissable – just look for the unmistakably Venetian boats moored up along the canal. The boats along Little Venice are a much-loved part of the fabric that makes up London, and they have their quirks all year round. It really turns things up a notch, however, during Canalway Cavalcade. The annual celebration sees a great turnout of the many boats along the canal. It’s all incredibly British, with real ale and Morris Dancing. If you’ve never seen Morris Dancing before, well – you’re in for an experience. 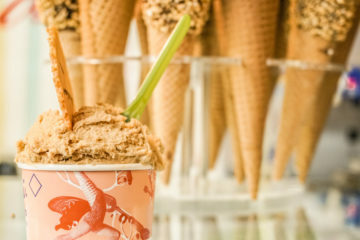 There’s also street food, live music and a generally jovial atmosphere to enjoy. It’s been held every year since 1983, and coincides with the May bank holiday weekend. Alan Turing is one of the most significant figures in British history, having left behind a legacy that affects all of us. You can see a plaque commemorating the place of his birth in Little Venice. Alan Turing’s profile was raised considerably thanks to the Benedict Cumberbatch film, The Imitation Game. The movie told the story of Alan, and his work in breaking the German Enigma code during World War II. After the war, he then went on to be a pioneering computer scientist, helping to build the first ever automatic computing machine in the 1950s. Tragically, Alan was born at a time when homosexuality was illegal. Openly gay, he was prosecuted and even banned from continuing his work. His untimely death at just 41 cut short the life of one of Britain’s greatest minds. His legacy has also touched Britons in another way – he was posthumously pardoned in 2013 by Queen Elizabeth. Furthermore, a law which is now known as “Alan Turing’s law”, and scrubbed all historic convictions for homosexuality. Hands-down the best way to discover Little Venice is on foot. It’s wonderful just to discover the many secrets down its laneways and canals. There are a few important stops, though, so why take yourself off on a self-guided Little Venice, London walk? 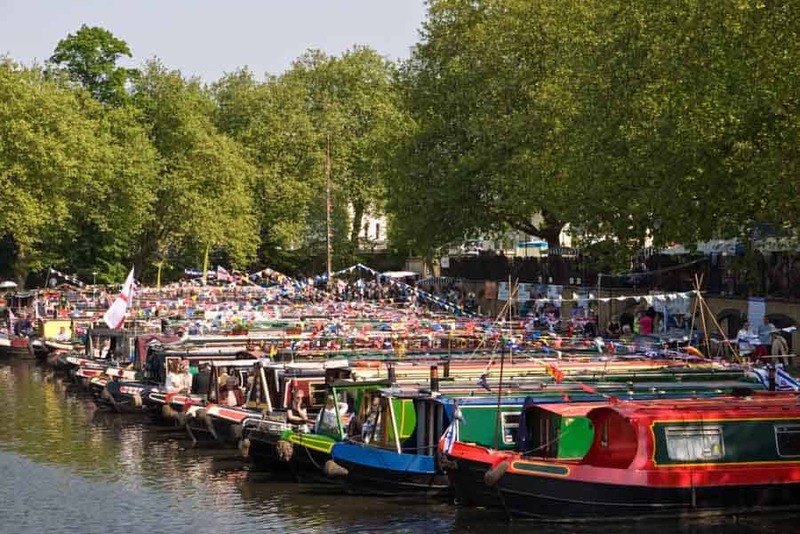 Here’s a fun itinerary that takes in the main Little Venice attractions. An easy landmark to begin your walk is near the Mary Magdalene Church, at the corner of Rowling Street and Senior Street. If you follow Senior Street, it becomes Delamere Terrace and will wind you long the side of the canal. Here, you can find plenty of gorgeous quirky boats. Continue walking along the canalside, taking in the sight of the boats. After about 5 minutes, you’ll come to a bridge over the canal. 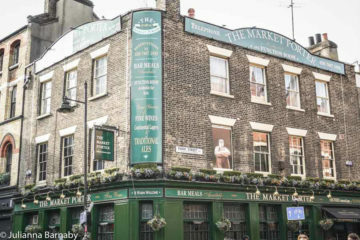 Here, you’ll also find the famous Canal Cafe Theatre – perfect to pop in and grab a coffee. After you’ve stopped for your coffee fix, turn left and head over the bridge. On your right, you’ll see Jason’s Trips – one of the boat companies where you can take a ride down the canal. After the bridge, turn right along Blomfield Road. After about 500 feet, you’ll see the Puppet Theatre Barge. You might want to try to time your stop with a show, or just admire it from the footpath. Continue in the same direction, and then turn right onto the bridge close by. You’ll know you’re in the right direction as you should see Rembrandt Gardens on your right. If you continue on for another 150 feet or so, you’ll see the entry gate so you can explore the gardens. Once you’ve seen the gardens, turn back the way you’ve come and retrace your steps over the bridge. I’d suggest then turning left back onto Blomfield Road, so you can admire all the adorable boats on the other side of the river. Just in front of Waterway Restaurant (a great lunch stop), the road curves right. Follow it around the bend and continue walking along it, past the roundabout until it ends. 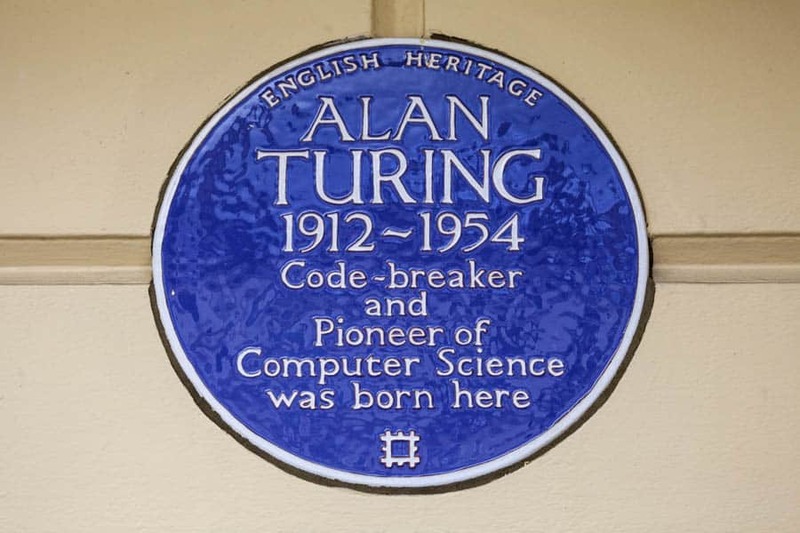 Here, turn right onto Warrington Crescent – the home of the famous Alan Turing Plaque and the end of the walking tour. If you continue on just a bit from here, you’ll find yourself at the Warwick Avenue Tube Station. 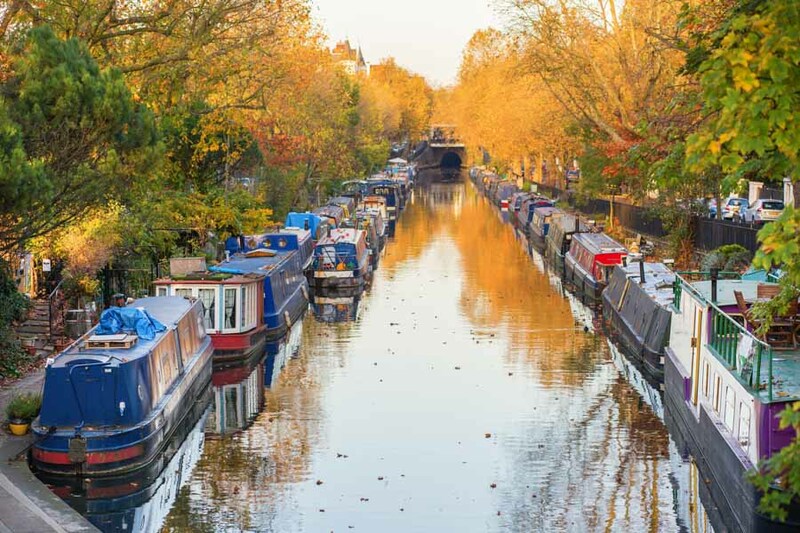 Although nearby Maida Vale is famed for its elegant mansions, Little Venice has a peaceful, quirky vibe, with lots of quaint and colourful boats. This quirkiness has definitely filtered through to the shopping in the area. Around Little Venice, you’ll find lots of cute, independent stores like The Winery in an old apothecary. 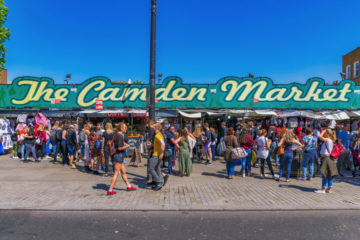 Plus, the markets of Camden and Portobello are also within walking distance of the area. 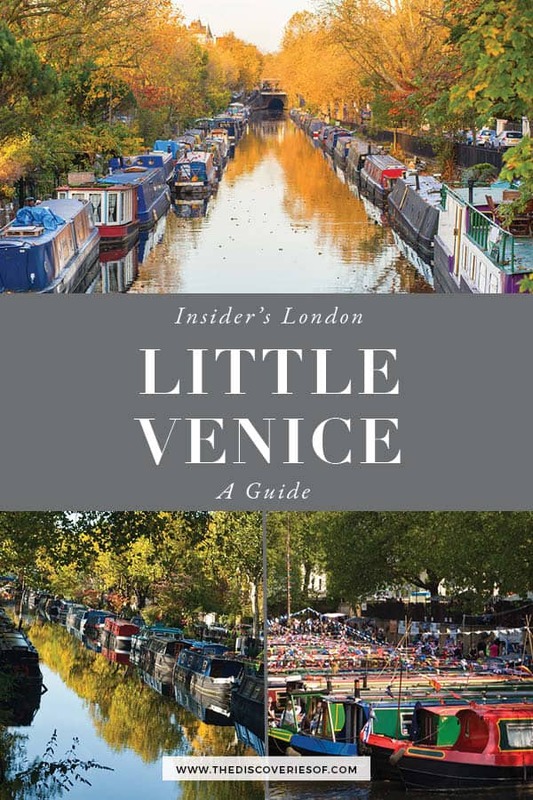 Whether you’re just doing some window shopping or find yourself some unique souvenirs, it’s well worth checking out Little Venice’s shops. If Little Venice has got you in a peaceful mood, head down to enjoy the laid back and friendly Quince Tree Cafe. Nestled in Clifton Nurseries, it’s surrounded by plants an rustically decorated. The menu is simple but tasty. Delicious Mediterranean meals with an amazing view of the canal? Yes, please. My pick of the Little Venice restaurants, Cafe La Ville features a fabulous menu with tempting Italian favourites such as Linguine Amore and Carbonara. Yum. Waterside Cafe is a much-loved icon – I mean, who doesn’t love the idea of enjoying a tasty lunch served from a boat? There’s space to dine indoors, but if you haven’t got your sea legs yet then there are also seats on dry land. The menu is simple but tasty, with options like sandwiches and paninis. This lovely Little Venice pub fits in just perfectly with the area – offering just the right amount of character and quirkiness. 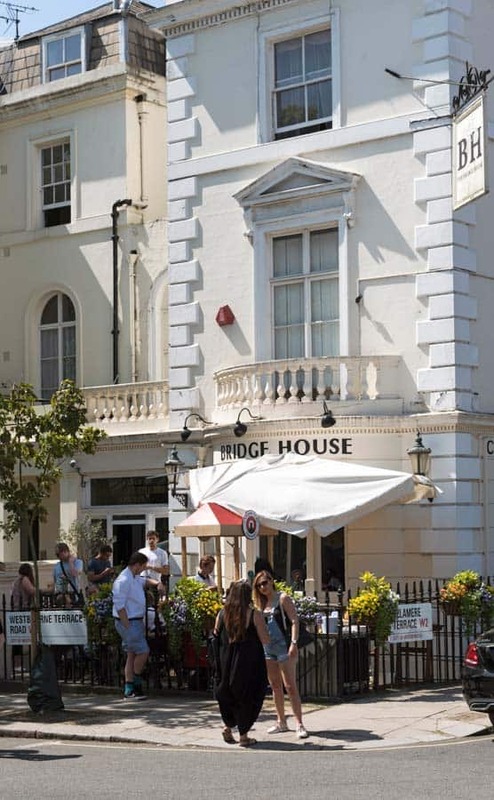 The Bridge House serves up tasty British pub classics, as well as a few modern options (such as Calabrian antipasti platters). Plus, there’s a generous selection of drinks on tap as well. For foodies looking for a gastropub in Little Venice, the Waterway is a great choice. Their confit duck is particularly delicious. Another highlight is the outdoor dining area, perfect for soaking in the ambience of Little Venice. You can even enjoy a delicious cocktail while you appreciate the good vibes. If you want the quintessential London pub experience in Little Venice, head for the Warwick Castle. This cosy pub has been welcoming visitors since 1897, and never disappoints with its generous selection of beer and hearty menu. 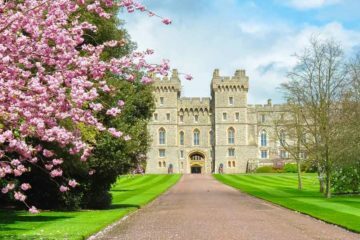 Just look for the gorgeous, flower-laden exterior. As the area is small, there is only a modest number of true Little Venice hotels. 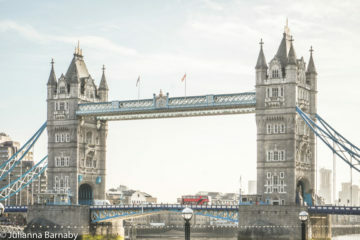 These are great options, however, as Little Venice is a wonderful base for your stay in London. It’s a quiet little oasis amongst the bustling city. One centrally located hotel is the Colonnade Hotel on Warrington Crescent. Check prices and availability. Given how centrally Located Little Venice is on a London map, it’s no surprise that it’s easy to reach by public transport. There are also two tube stations near by – Warwick Avenue and Maida Vale. Warwick Avenue is the closest of the two, and is serviced by the Bakerloo line. Maida Vale is also on the Bakerloo line, and arrives at a beautiful old station that is an attraction in its own right!